The full paper is available Open Access at the Marine Biodiversity Records website..
Background: The status of the dusky dolphin (Lagenorhynchus obscurus) around the Falkland Islands (south-west Atlantic) has been long debated, since most records published to date lack supporting information. There is also considerable scope for confusion with the sympatric Peale’s dolphin (L. australis), which has a similar external appearance. Results: A literature review confirmed one previously-published record as dusky dolphin; a skull that apparently originated from the Falklands in 1955. Four new photographically-supported records of dusky dolphin are described, comprising three sightings and one live stranding. Two sightings consisted of the same dusky dolphin individual in a mixed-species association with Peale’s dolphins in coastal waters. An additional sighting established their use of deep, offshore waters around the Falklands. Conclusion: The dusky dolphin is a confirmed component of the Falkland Islands cetacean community, but appears to be relatively uncommon. 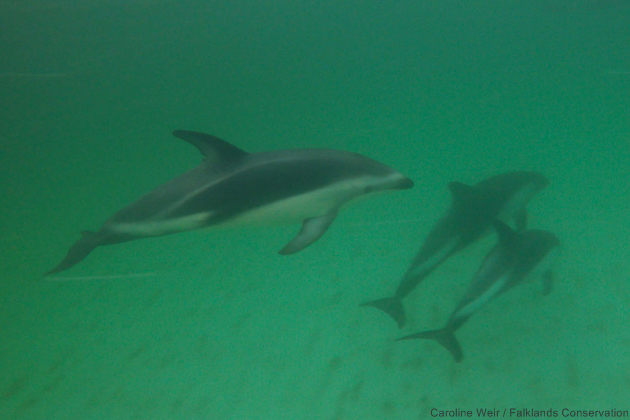 The first documented occurrences of an association between dusky and Peale’s dolphins emphasises the need for vigilance when identifying dolphins during cetacean surveys in the wider South American region.